This procedure is also called as percutaneous glycerol rhizotomy. This is an outpatient procedure. Under sedation doctor inserts a needle through your cheek and into an opening in the base of your skull. 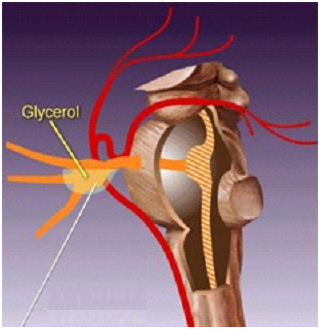 The doctor injects a small of amount of sterile glycerol into the small sac of spinal fluid that surrounds the trigeminal nerve ganglion and part of the root. This chemically damages the nerve fibers. Pain relief is immediate however many experience mild to moderate facial numbness.